Prepare Pizza dough per package directions. Let raise 5 minutes. 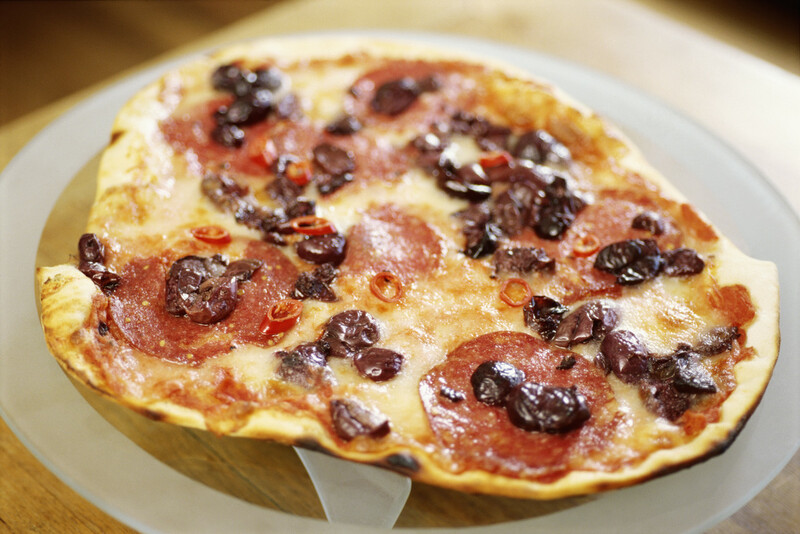 Spray pizza pan with Pam and spread dough across the pan, carefully and gently. Prick holes in the dough with fork tines, evenly across. Bake in 450° oven for 6 minutes or according to package directions. Remove from oven and spread about 1/2 jar of pizza sauce on top of dough. Add toppings, spreading evenly. Bake for 14 minutes on lowest oven shelf. Remove from oven when dough is slightly browned and crisp. Let set for 5 minutes, then slice and serve. Any alternate toppings can be used. Make it a veggie pizza, all meat, fruit, or whatever. You’re the chef! This entry was posted in Recipes and tagged DELICIOUS, HOME-MADE PIZZA, ONIONS, PIZZA, PORTABELLA MUSHROOMS, SAUSAGE, SWEET ITALIAN SAUSAGE. Yumm… but my husband is addicted to Papa John’s – even when I offer to make a “healthier” one from scratch. Maybe it’s the word “healthy” that scares him! Looks delicious! My boys love pizza, and let me use your recipe to make one for them. Thanks.